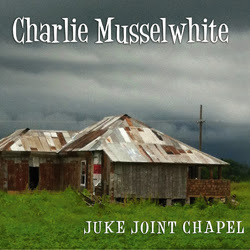 I just received the newest release, Juke Joint Chapel, from Charlie Musselwhite and it's a monster. I've been listening to Musselwhite for years and I can honestly say that this is my favorite release in some time. Opening with Eddie Taylor's Bad Boy, a super shuffle track, Musselwhite sets a firm groove. Musselwhite has a distinctive style and tone and it's strong here with Charlie on vocals and swinging guitar work from Matt Stubbs. On Shakey Jake track Roll Your Money Maker, Musselwhite and bassist Mike Phillips have a lot of fun with the vocals and Stubbs rips out some smoking hot riffs. On Tony Joe White's As The Crow Flies, Musselwhite really gets the Chicago groove going on harp. With some hot work by June Core on drums, Stubbs steps up with cool great riffs. On Billy Boy Arnold's Gone Too Long, Musselwhite takes a more melodic take on his solo with sounds of his work from the 70's. Very cool. Stubbs steps up again with some really nice riffs doubled up on the double stops. Little Walter's It Ain't Right is up next and Musselwhite has you hopping out of your shoes. Great harp work! On Strange Land Musselwhite keeps the basic track simple giving him a lot of breathing room to play some super harp. Stubbs and Musselwhite play in a tandem jam building to a hard driving crescendo. On original track, Blues Overtook Me, Musselwhite sets a really nice pace to accommodate his personal style. This is a nice long harp jam and Charlie doesn't waste a note. Stubbs also takes a cool opening on this track keeping the groove moving. Really nice. River Hip Mama is a boogie track with Musselwhite leading the way against the guitar vamp. This track like many of the others hits a high spot where Musselwhite and Stubbs trade riffs and the track is really cookin. Another original track, Blues Why Do You Worry Me, has a solid Chicago feel with Musselwhite playing a cool intro and singing lead. What differentiates this release from other "traditional Chicago" blues releases? These guy jam it out and have fun. most of these tracks are 4-6 minutes long and that gives the band a good opportunity to show their chops. Feel It In Your Heart is an unusual track with a Latin style rhythm and a bit of a western sounding arrangement. On Prince Conley's I'm Going Home, a jazzy blues number, the band plays a really cohesive rhythm for Musselwhite to sing and play harp. Stubbs also contributes a really nice solo on this track. Duke Pearson's Cristo Redentor is a somber instrumental ballad featuring Musselwhite and his signature tone. It's a really cool track to wrap up a great new release.